Talk about versatile. Our extension cord plugs into any 3-pin socket, extends a full 5.10 feet & provides 4 separate connectors. Can handle 250V & 2500W. Convenient on/off switch. Tired of cluttering your home or office with messy, tangled wires? 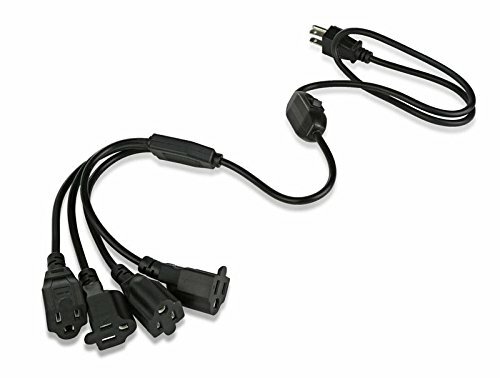 Here's your perfect solution: our 4-in-1 extension cord from Homerygardens. Your typical extension cord powers just one apparatus... so you have to use multiple cords to run multiple devices. That's messy & inconvenient. This Homerygardens extension cord is different. Its 5.10-foot cable branches off into 4 separate cords, each with its own 3-pin connector. You'll use just 1 cable to power 4 devices, so you'll save space & minimize clutter. Why not order 2 or 3 for different parts of your home? Great gift & stocking stuffer, too. 4 Connectors: Most extension cords power only one device. But your Homerygardens cable branches off into 4 separate cords, each with its own connector. Perfect for powering multiple adapters & more. Saves Space: Why clutter your home or office with a bunch of tangled cords? With this ingenious cable, you'll use just one main cord to power 4 different devices... so you'll cut down on mess & chaos. Durable & Versatile: Thanks to its weather-resistant cable & water-resistant prongs, your rugged new extension cord works well both indoors & out. Great with computers, monitors, printers & more. 100% Guaranteed: We're sure you'll love using your new Homerygardens extension cord. But if you're unhappy for any reason, return it anytime for a full refund or free replacement. If you have any questions about this product by Homerygardens™, contact us by completing and submitting the form below. If you are looking for a specif part number, please include it with your message.